I was already practicing my Bikram Yoga a few times a week, but had to take a few days off while analyzing the situation with my back. After a couple of days that’s when I decided I’d implement what I knew would be the best remedy to heal my condition- I decided to expedite the healing process by taking on 60 days of yoga in a row (60 sessions in 60 days). It was a simple decision to make because I knew it was the best thing that my body would respond to. I know this based on past experiences- many years back when I had back issues I had undergone continuous, regularly administered chiropractic sessions, physical therapy sessions, massage sessions- every week over a span of several years. All of these therapies at times provided a temporary relief for about a day or so, but my back issues were chronic and something I just had to learn to live with. Well I was fortunate enough to discover Yoga; it was the only thing that worked and it was immediate- I felt relief right away after my first Bikram class. 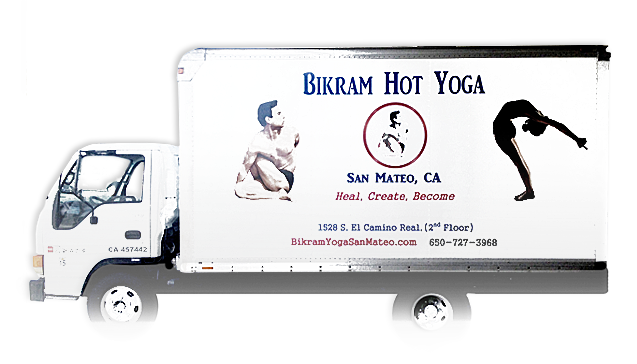 With my history of these issues I knew that I would be able to heal my back naturally/holistically via Bikram Yoga- So the 60 days began! The result on my lower back injury: by week 3 of the challenge my back was at 100%. At first, probably like many other people- my first thought was “my life is really busy”, how am I going to fit this into my schedule every single day for 60 days? I’m a single dad and run multiple businesses and projects. In the beginning it was a little bit of a juggling act and making adjustments to make my schedule work. Some days I had to practice super early, which I thought would be somewhat of a challenge being that I’ve always considered myself to not be a “morning person”. Other times I would practice late at night, I had to throw in the occasional double class (two classes in 1 day). I quickly realized that its best to take each day, each class, as it comes, one by one and not focus on the overall amount of classes. Once the daily habit was implemented it exactly became that- a habit (a healthy habit). Someone once told me that it’s just as easy to create a bad habit as it is to create a good habit, so choose wisely in what you decide to focus your time on. It takes approximately 28 days to create a habit or to break a habit. Once you hit that special # then it just becomes kind of easier- the mind and body are flexible and make the appropriate adjustments accordingly. I remember in college, I was a wrestler in a Division 1 wrestling program. The first 3 weeks of practice in the preseason were the most challenging- everyone would be puking, collapsing, whining, exhausted- but after 3 weeks of hell the body and mind have no choice but to accept and adapt to what your wanting it to do. Basically you get stronger. I imagine many people can correlate this with other things they’ve done in their lives, e.g. military, college, sports, new business, etc. My personal experience from the practice of yoga is that I found that I have more energy, my mind is more relaxed, more mental clarity, and I’m more efficient in doing all of the other things that need to be accomplished throughout my day. Those 90 minutes spent in the yoga room, although it may seem like a lot of time- it is given back many fold in how I feel and how I’m able to manage the rest of my day. Everyone has the same amount of time in a given day; how the time is managed and how efficient one is with that time is what really makes the difference. What’s the use in having all the time in the world if you feel sluggish, scatter-minded, tired, bored, melancholy. I find the yoga to boost all areas of mind, emotions, attitude, and creating an overall good feeling throughout the rest of the day. I have gone through something like this 60 day challenge before when I went through the 9 week Bikram teacher training, where I took 100 classes in 62 days. During that process many things happened- facades are stripped down, varying emotions are relinquished and submerge to the surface, and total awareness becomes prevalent which equates to clarity of self and your life. With this prior 9 week experience I was also open-minded to the potential of some psychological, emotional, or spiritual shifts to take place during the 60 day challenge. These things all did take effect to some degree, some at very subtle levels and others in more prevalent “Aha” moments. Here is a quick summary of the intangible (non-measurable) results of the 60 day challenge. For myself I was able to become aware of a couple of blind-spots, these are road-blocks or ways of being and believing that prohibit a person from being a more authentic self and from moving forward to achieve positive outcomes in life… this is where some of those “Aha” moments come into play! I won’t get into the details of my “Aha” moments because it is personal and also because I don’t want to make this blog longer than it is already becoming. I also want to mention that through yoga, I have been able to become more in tune with myself; meaning it has allowed me to effectively listen to my internal voice (for lack of better words)- to trust myself and my instincts. I find that this awareness in of itself helps in all other aspects of my life- business, relationships, and overall decision making. To my surprise several years ago I discovered that I had high blood pressure: 140 systolic pressure over 95 diastolic pressure. I was surprised due to the fact that I have generally lived a healthy lifestyle- eating healthy, exercising, etc. My doc said I would need to start taking blood pressure medication. The thought of having to pop pills for the rest of my life was not an attractive prospectus that I had envisioned for myself. I thought I would see if I could get my blood pressure to go down naturally via yoga. It wasn’t until the end of this 60 day challenge that I tested and saw my blood pressure drop down to 120 over 80. I did a double take the first time and re-tested several times to make sure. I was amazed and elated to see that my blood pressure was now normal. This means no pill popping, no potential diabetes, along with all of the other health risks that come with high blood pressure. Deciding to take on the 60 day Challenge and completing what you set out to accomplish brings about a feeling of achievement. Proving to yourself that you can do what you set your mind to. The challenge forces you to flex your determination “muscles”. You learn to be accountable to the most important person, which is yourself. You prove to yourself that you can make a decision, stick to it and follow through with it to the end. This develops confidence and self esteem in knowing your abilities as a person. You can carry these attributes into any other things you decide to do. Personally I feel that I will do a 60 day challenge 1x ea year. In retrospect I have to say that the challenge really is not that hard to do- It’s not like navy-seal training, surviving catastrophic events, or like the many more challenging things that humans have undergone and survived. Really doing yoga every day is pretty fun, its good for you, it makes your life better, and you learn to really enjoy it. In a nutshell… It’s a journey, different things come up for different people. Maybe try it out for yourself! See what happens.